If you're the type of man who likes to wear mens dress shirts that don't look like you work for IBM. The type of dress shirts that have stylish colors and designs that just make any suit you wear pop. Try Fratello dress shirts. 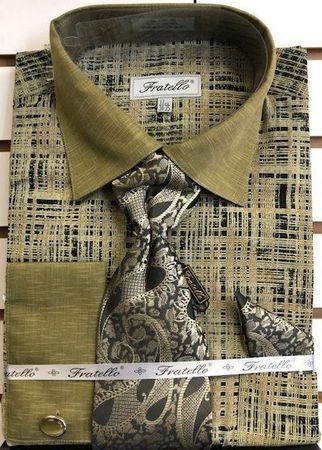 Fratello makes head turning dress shirts for men that are all designed in Italy and have the fashion forward attitude that style minded men want to be seen wearing. This mustard and black etch plaid shirt featured solid color french cuffs and collars.